Around New Years, my wife and I jumped on the Downton Abbey bandwagon and binged-watched the whole series in about a week. For those who don’t know, Downton Abbey features an aristocratic household in the early 20th Century, following the lives of the Lords and Ladies who live “upstairs” and the servants who live “downstairs” at Downton Abbey. Downton’s appeal is that it is like a view into a time that our world can almost remember. My grandfather born in 1919 would have been a baby just around the time the show takes place. It is almost memorable for us but still so very different. Now, I promise no spoilers. One of the main themes of the show is change. The early 20th Century was much like the early 21st Century is now. There was a technological revolution taking place, and it is funny to watch the characters of Downton deal with the newness of very old technology. Electricity, phones and automobiles were transforming the way people communicated, traveled and worked. There were new jobs which required new skills, while old skills and jobs were being made obsolete. Communication over long distances was now instant and ubiquitous, with phones being installed in houses. Cars allowed people to travel farther and faster. Medicine was being revolutionized with anti-biotics and surgical procedures. And of course, warfare became more deadly with inventions like machine-guns and tanks. Alongside this great technological change was social change. The established social orders were unravelling, the servant class looked forward to new opportunities, while the upper class watched as their power and influence eroded. While the show hasn’t made it as far as the Great Depression, this event would become a seminal moment of this era, leading into a very different middle 20th Century. Communication and technology were creating a new democratization of opportunity. The social playing field was levelling. The technological and societal changes were evolving a world for the young adult generation that was very different than the world of their parents and grandparents, causing generational tensions. This all sounds somewhat familiar doesn’t it? I don’t think Downton Abbey would have worked as a show 10 years ago. Yet, today we can equate the experience of a phone in every house with a smart phone in every pocket. We can understand the experience of new ubiquitous instant telephone communication like new social media connectivity. We experience clear class distinctions with our growing economic disparity and inequality. These mirrored experiences with our great-grandparent’s generation make the show appeal to our present. However, as a pastor, there is one thing that makes my hair stand on end, episode after episode. Throughout the show, characters often talk about how “everything is changing.” Even though it isn’t always clear what this new technology and these new social attitudes will mean for the world, everyone carries a deep sense of change. Some embrace the change and look forward to this new world. Others grieve it and lament what these changes will mean. In particular, the privileged upper class is generally fearful of what they will lose and often work to prevent or slow the change. The servant / working class generally embraces the change, looking for what they can gain and attempt to hasten the arrival of this new world. The experience of “change” that the characters are having is uncannily like the experience of change that so many churches are going through today. In fact, there are moments in the show that feel so much like my day to day life in ministry, as those around me have the same deep sense of the “changing” world of our time. The image of our contemporary church that Downton presents is not lost on me for a second. As these once great aristocratic families wander about this great house, this great mostly empty Abbey (or church), bemoaning the change going on about them; they have no idea how they got to where they are, they do not know how to react or what to prepare for. As it becomes clearer that their traditions and social standing are no longer relevant or guaranteed by society itself, the upper class holds on tighter and tighter to what they once had and long for a return to earlier times. Just to make sure there is nothing missed, the completion of the mirror image comes in the grief the upper class carries for their loss of privilege. No, the image that Downton presents of present day Christianity, especially mainline Christianity, is not lost on me at all. 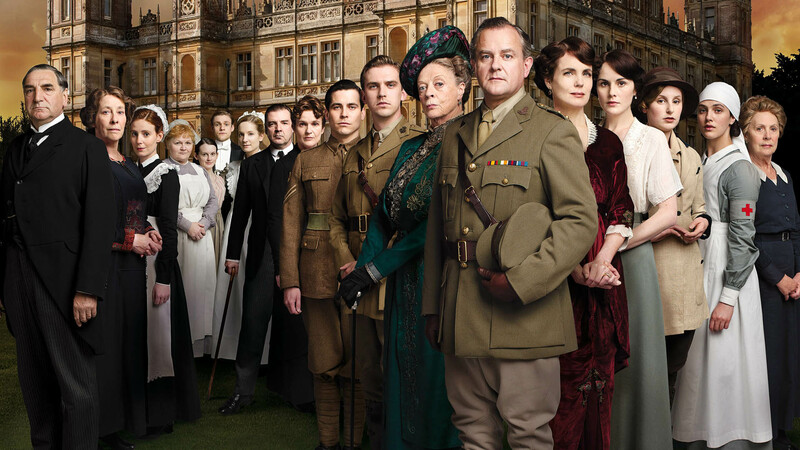 Downton Abbey should become required watching for churches today. It would serve us well to see just how blind we are to our entrenched societal privilege. It would serve us well to see how our traditions are viewed by those forced to attend to them rather than benefit from them. It would serve us well to see how our privilege is not going to last forever, in fact, it will probably not even last the decade. As our privileged position of being the state and social religion, of being the dominant culture and moral system, of being able to discriminate for “religious reasons” is coming to an end, it can only be a good thing for us. This is where the gospel part of Downton Abbey comes in. The privileged class sees only the loss of their position and power in the world, but the under class starts to see the beginning of something new. They see hope for a different world. As a millennial, I only have the foggiest or vicarious memory of the glory days of Christian privilege. As a pastor, I don’t remember being a well respected authority figure in the larger community. I don’t remember churches having much, if any, influence over society around us. But like the young aristocrats of Downton Abbey who are far more comfortable with this new world, and who are far more comfortable interacting with the lower classes, I am ready to be – and to lead – the Church into this new world. It is very tempting to lament our loss of privilege, we could just wander about our big empty churches wondering how we got to where we are, but the Good News of Downton Abbey is that our privilege is being stripped from us. It is Good News because the barriers that prevented the under-privileged from integrating with us are falling down. It is Good News because we can now begin to play on a level playing field, a democratized playing field where people can choose us, rather than be forced to adhere to us. It is Good News because, like the aristocrats of Downton Abbey, it is time for the world to stop serving us and for us to start serving the world. Besides, I think serving the world was kind of big deal for that guy we like to follow… Jeeves was it? Or Juan? So are you a fan of Downton Abbey? Experienced the Church’s struggle with change? Share in the comments, on Twitter: @ParkerErik, or on Facebook. God’s Holy Word hasn’t changed, or how He wants His people to use it to pattern their lives by.